Description: Perfect for the final Mystagogy class of RCIA as a send-off into the mission of the Church. Inspire your Neophytes to get involved in parish life and to help others join the journey of faith. It’s recommended that catechists first read Pope John Paul II’s encyclical Redemptoris Missio in preparing the lesson, but this is not required. This package includes a Commissioning Rite (1-page hand-out) and a Catechist Guide. Special Note: This is also available as part of the Mystagogy Retreat, “Gifted and Sent”. End the RCIA journey by sending your Neophytes into the bigger journey of walking with Christ in the continuation of his ministry. Empower them to become active participants of the parish and fruitful stewards with their gifts and talents. More ideas for use: This PowerPoint package is also great for Evangelization Teams, Staff Retreats, Ministry Workshops, Pentecost events, prayer groups, etc. 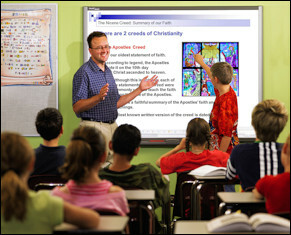 The same presentation can be readily adapted to a parish seminar about evangelization at any time of year. It’s especially ideal for Pentecost. This is included in “Mission of the Redeemer” PPT package above. Add to the order only if you want copies for other uses in the parish or do not want the PPT.